The 3-month, halfway-around-the-world trip that myself and Peter made in the latter half of 2009 has so far been one of the most memorable events of my life. A 30+ hour flight to New Zealand, backpacking, driving a camper van through vast empty stretches of the countryside without another vehicle in sight, spending a special day on an almost empty beach resort on an almost remote island in Malaysia, riding a roller coaster built within a shopping centre in Kuala Lumpur – these are just a few of the exhilarating experiences we had during our trip. Of course, food formed a very important part of the journey and experience as well. From great quality organic food in New Zealand (we tasted, by far, the best meat we’ve ever had in NZ) to the exotic fusion cuisine that’s the hallmark of Malaysian food, I only have mouth watering memories of food in the countries we visited. 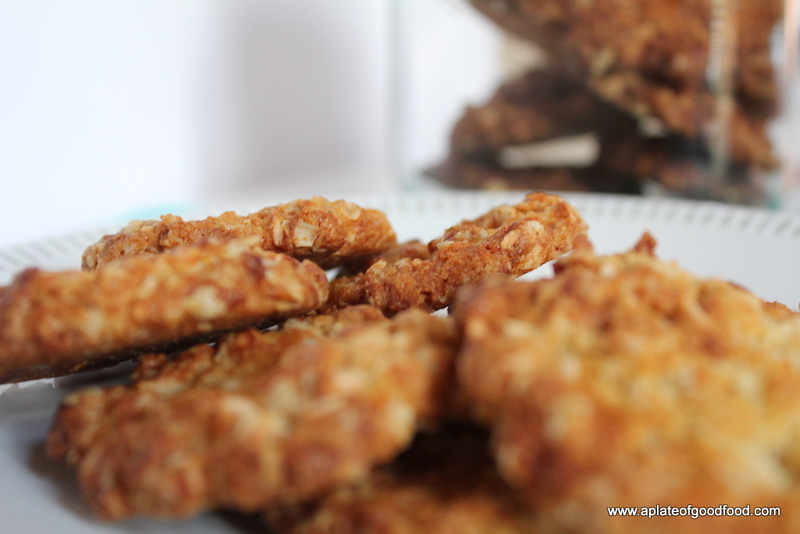 One such food item I tried and fell immediately in love with are anzac biscuits. 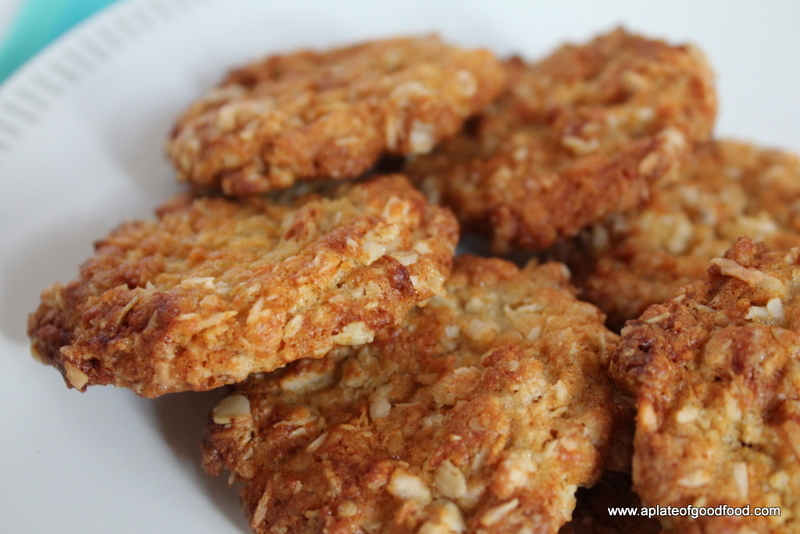 I later learned that these chewy, coconutty biscuits are a mainstay of Australia and NZ. The story goes that these biscuits were made by soldiers’ wives to be sent to their loved ones since they keep for long and don’t go bad so easily. So, when I saw a recipe for these biscuits in the BBC GoodFood baking magazine I’d bought recently (and is now falling apart from frequent use! ), I knew I had to give it a go. This is one recipe that doesn’t call for too many ingredients and am sure you’ll find almost all of them lying around in your kitchen cupboard already. 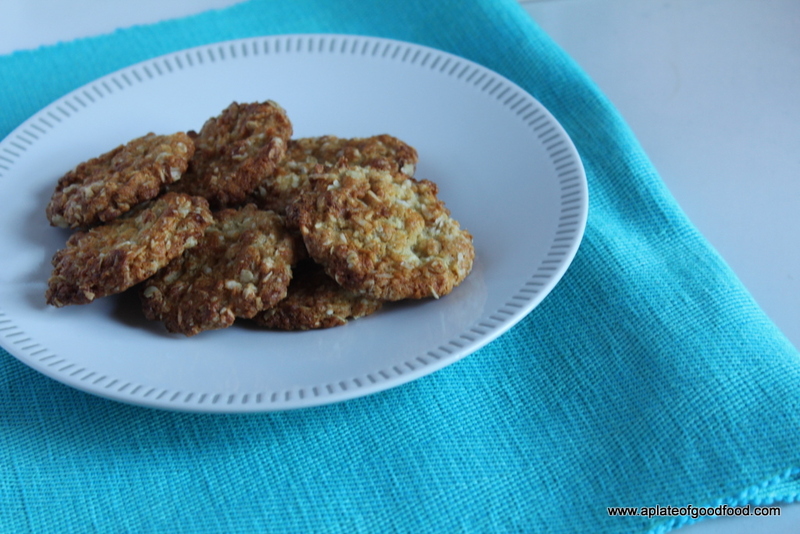 So, whenever you feel like making a quick treat for yourself, do think of anzac biscuits! Heat the oven to 180 degrees Centigrade. In a bowl, mix together the oats, coconut, caster sugar and flour. Melt the butter in a pan and add the golden syrup. Dissolve the soda bicarbonate in 2 tablespoons of boiling water and stir into the melted butter and golden syrup. Add the wet mixture to the dry ingredients in the bowl and stir to combine. Line a baking sheet or two with baking paper. Place small spoonfuls of the mixture on to the baking sheets about 2.5 cm apart since they spread on baking. Place in the oven and bake for 8-10 minutes. If you’re using two baking sheets placed one below the other in the oven, it’s a good idea to switch their positions and turn the baking sheets around as well half way through the baking time. This allows for even baking all around.